The project CONVERSION by the Recycle Group (Andrey Blokhin and Georgy Kuznetsov) refers to the life of a modern man as it is in the age of the world web and new gadgets. Data transmission speed, constant data refreshing and availability – with every seventh person on earth owning a smartphone – have given birth to the cult of new technologies. The Recycle Group’s project compares the globalization of information networks to the conversion to some new ‘reli-gion’ where the scope of information available in the virtual space is a new presiding deity. 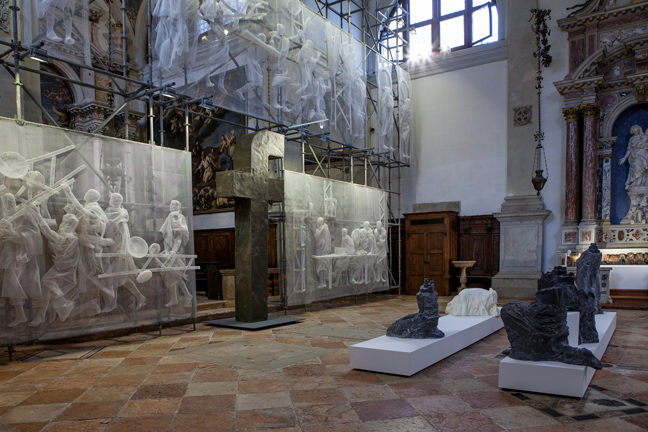 At the ancient church’s hall, Recycle Group will present the ruins of the sanctuary of the XXI century. 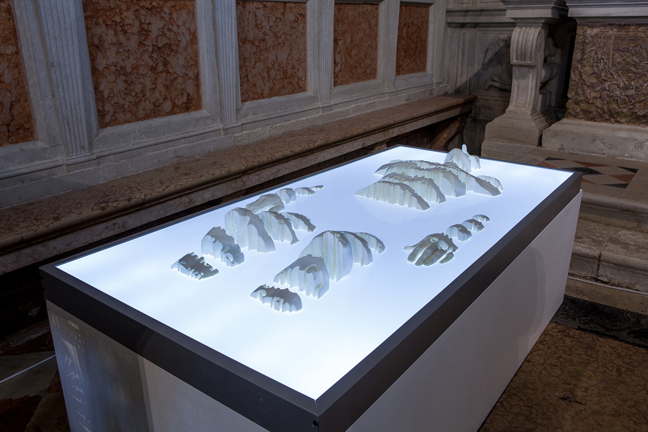 The show CONVERSION will include sculptures and bas-reliefs, in which figures of ‘Neo-Apostles’ appear as the bearers of a new sacred knowledge manifested in the stream of virtual information. This imposing structure is sited in the traditional position of the church altarpiece. 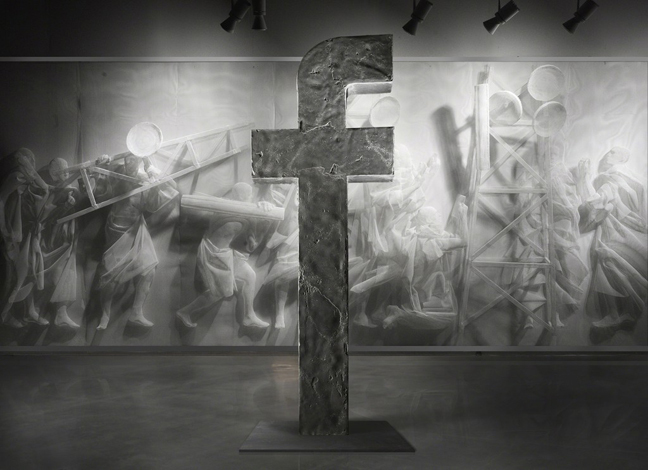 At the centre as if surmounting the altar, is a giant Facebook ‘cross’. The display also includes ‘wooden remnants’ of Noah’s Ark, with familiar icons from smartphone screens identifiable in its fragments. 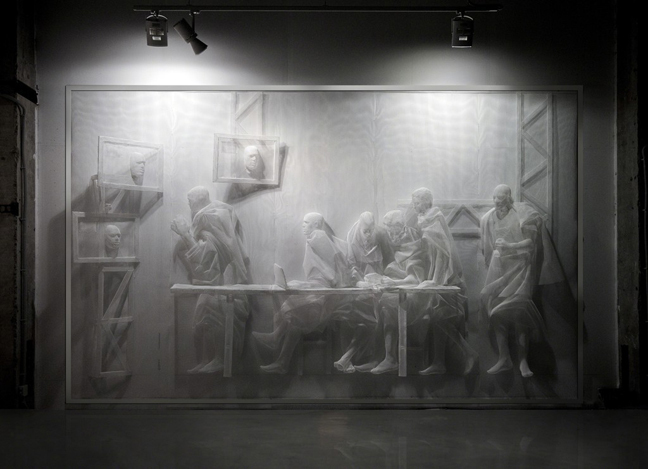 To make sculptures of the presumed ‘saints’, the preachers of the new technologies, as well as multi-figured bas-reliefs the Recycle Group makes use of polyurethane, plastic mesh, rubber, polyethylene and new technologies. 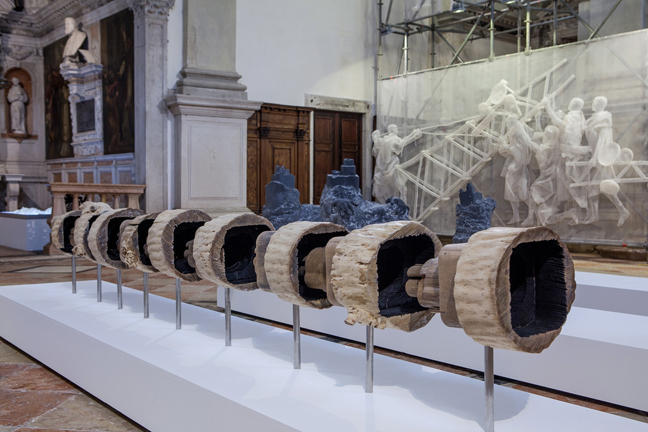 Rubbish becomes art to be kept for future generations, while the artists seek to give their viewers an idea of the future traces to be left by the paradoxes of our own age, of what will go down in history. 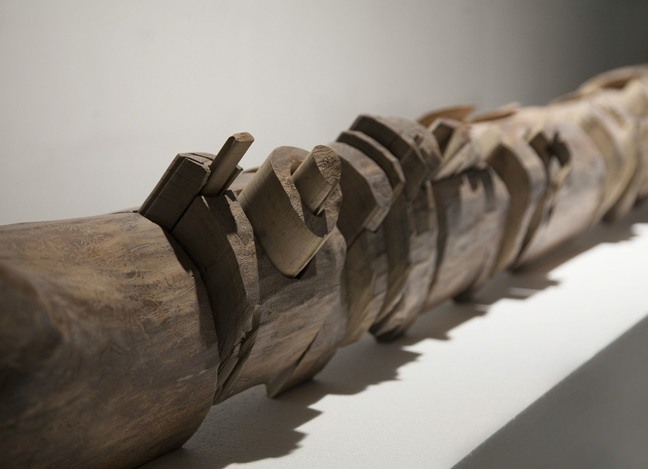 Their sculptures and bas-reliefs take on the appearance of ancient monuments that display the ravages of time, as if artifacts from some lost and forgotten civilization. The forms and compositions of the Conversion project are influenced by traditional Christian iconography, yet they are disseminated by contemporary motifs like the info graphics of modern gadgets and app logos. In one relief among the ‘holy’ figures rise cell phone masts, while another scene entitled In Search of the Web depicts crowds of people struggling to get online with their mobile devices. As if by ironic coincidence there is an existing cell phone mast sited in the bell-tower of Sant’Antonin church.